Gems in Gacha Life are normally earned by playing the various minigames but there are two ways to get them free and both require minimal effort. Tapping the 'Gifts' button on the 'Home' screen will enable you to claim miscellaneous rewards from the game. 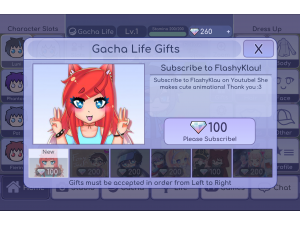 In this section you will also be able to subscribe to the different channels of each game developer who will reward you with 50 gems for doing so. Every few minutes on the 'Home' screen a 'Watch Ad' button will appear which will enable you to earn free gems simply by watching a short advertisement video. The number of gems you are awarded is random but it can be up to 150 gems for a single add which makes taking advantage of this opportunity a must.